This module is designed for those who must design the longitudinal profile of the ground complete of all the elements of power lines. You can import data directly from plano-altimetric survey, in free form or along a references axis. The hyperbolic curve is defined by positioning the supports and by defining the coefficient relating to the calculation of the arrows. 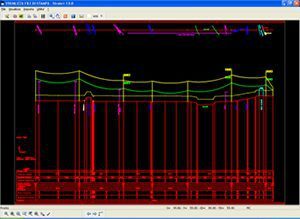 Strato® is also provided with special commands and symbols that help you to complete, graphically, profile and planimetric drawings.